For too long right-wing extremist and neo-Nazi organizations have had their way across Europe. They enjoy freedoms and liberties to organize, demonstrate, express themselves and terrorize opponents under the guise of civil and political rights -- rights that other extremist groups such as extremist groups that kill in the name of Islam do not enjoy. It's time to pull the plug on violent extremism in all its forms. Violent extreme-right organizations should be outlawed like all other extreme groups that claim lives through senseless acts of violence across the world. Political extremism should be painted with the same brush like religious extremism. A 28-year-old man died in hospital in Finland one week after he was assaulted at a neo-Nazi demonstration in broad daylight in the heart of Helsinki. According to Helsingin Sanomat, the victim was assaulted in front of Helsinki Central Railway Station on Saturday 10 September. His father told Helsingin Sanomat that the attack took place at a demonstration organized by the Finnish Resistance Movement known in Finnish as Suomen vastarintaliike - an infamous neo-Nazi organization. Police confirmed to Helsingin Sanomat that a man received strikes to the head in the city center but were initially tight-lipped about the case. However, details of the case quickly became clear. According to Ilta-Sanomat the victim, Jimi Joonas Karttunen, died on Friday 16 September at 10 pm. His father made a police report on Monday. The grieving father told Ilta-Sanomat that his only son was pushed to the ground, hit his head and lost consciousness. He was taken to hospital in Töölö from where he was discharged on Thursday. He however suffered from cerebral hemorrhage the next day and was able to call emergency services before losing consciousness. Emergency services found him on the floor and took him to Meilahti hospital where he died. His father described him as an "international, open person" who was interested in skating and snowboarding. He was born in Sweden and they moved to Finland just ten years ago. Ilta-Sanomat reports that the Finnish Resistance Movement posted its own version of events that day on its website. According to an update on the movement's website, "an activist intervened in a situation and gave a quick crackdown" to a heckler. A video published by the movement shows a man lying on the ground next to a blood splotch. Police detained a man born in 1990 in relation to the assault. According to Yle, the suspect turned himself in. He is suspected of assault and involuntary manslaughter. Another Yle report reveals that the suspected assailant has a violent background and is a founding member of the neo-Nazi Finnish Resistance Movement. Police confirmed the victim died of a head injury after being kicked. The accused was remanded in custody on suspicion of involuntary manslaughter which carries a prison sentence of up to six years, according to Yle. According to MTV News the accused has a heavy criminal record and history with the neo-Nazi Finnish Resistance Movement. For instance in 2010 he, together with a partner in crime, push over a man in Helsinki and kicked him in the face and body. In 2011 he tried to stop police from arresting another man by pushing and grabbing a police officer. In addition, he has previously been convicted of obstructing a public servant, smuggling, possession of a dangerous object and aggravated damage. First and foremost, my thoughts are with the family and friends of Jimi Karttunen. The senseless violence that claimed his life is utterly despicable and unacceptable. Jimi Karttunen died apparently opposing neo-Nazism and racism. According to his friends he had strong opinions and was not afraid to express them, and human rights were important to him. For this reason, as a person who shares his values with regard to human rights, I pay him homage. I was one of the numerous people who visited the crime scene and lite a candle in his honor. Reports say the 28-year-old met his end standing up neo-Nazi demonstrators. Police say the victim walked by a group of neo-Nazi demonstrators who gathered at Helsinki Central Railway Station, stopped by the demonstrators, exchanged words and was chased by one of the demonstrators as he walked away. He was kicked in the chest and hit his head when he fell to the ground. According to an eyewitness, the victim was hit on the chest by a flying kick and he did not have time to react. His father told Helsingin Sanomat that he went with his friends to express his views about the Finnish Resistance Movement. Not many people have the courage to stand up for what they believe in and make their voices heard. Jimi, according to his father was not a member of an anti-racism organisation. However, the fact that he expressed opposition to neo-Nazism shows that he was an anti-racist at heart. For that, I salute him. Losing a loved one is a horrible experience but I hope Jimi's family takes some solace in the fact that his death brought the threat of neo-Nazism, a long-standing and overlooked problem in Finland, to the limelight. 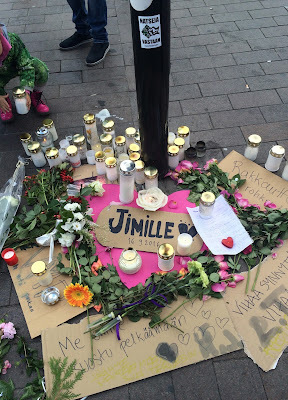 Hopefully, weeks, months or years from now Finland will look at the tragic passing of Jimi Kartunen as a defining moment in the fight against racism, neo-Nazism, far-right extremism and senseless political violence in the country. In this regard, Jimi would have literally left Finland a better place for all. There are already signs that things are moving in that direction. The tragedy on 10 September literally ignited overdue public discourse about how to eradicate neo-Nazism, a social-ill that poses a real threat to human rights in Finland. A lot seems to have happened since then - geared towards stopping the madness. For instance, Minister of Finance and leader of the National Coalition Party, Petteri Orpo, told Yle that violent right-wing organisations should be banned. The minister said if ways to ban political organisations that use violence are found he would support the ban. According to the minister extreme right organisations are security threat and a ban on such organisations had already been discussed in government at the beginning of the year but legal scholars have had different opinions on how violent organizations could possibly be banned; nine legislators launched a bill to outlaw "organized racism".They will need another 91 MPs to back their legislative proposal but it's a good start; an anti-racism demonstration (Peli poikki!) was organized and scheduled to take place on Saturday 24 September 2015. According to Yle 9 000 people had indicated on Facebook by midday on Friday that they would participate in the demonstration billed to "break the silence" on racism. At the time of this writing the number stood at 10 000. Prime Minister Juha Sipilä will participate in a related demonstration against racism in Kuopio. Former president Tarja Halonen will be one of the speakers at the Peli poikki anti-racism demonstration in Helsinki. The most important thing, I think, that has happened since the passing of Jimi Kartunen is the arrest and remand to custody of the alleged perpetrator. Police acted swiftly, which is absolutely commendable. If found guilty, the perpetrator should bear the full weight of the law. He should be slapped with the maximum penalty possible for such a heinous crime. Involuntary manslaughter, according to Yle, carries a prison sentence of up to six years. I would like to see the accused sentenced to six long years in prison. His colorful criminal record should make conviction easy. Given his record he poses a threat to public safety. He should be incarcerated for the maximum period of time the law allows. The sentence should not be suspended. He should spend the time behind bars. As for the so-called Finnish Resistance Movement -- it is a violent organization. It glorified the attack on Jimi Kartunen on its website by boasting about it in a post that described the victim as a heckler who received a "quick crackdown". That is according to Ilta-Sanomat. The "crackdown" apparently led to the death of a 28-year-old man. The death of Kartunen is not the first time the so-called Finnish Resistance Movement is involved in violence. In 2015, a demonstration organized by the movement went out of hand in Jyväskylä when members of the group entered a department store and assaulted bystanders. Three people were injured and thirty two people were arrested. Assault seems to be the group's preferred method of operation. It is high time Finland pulls the plug on violent far-right extremism before it claims more lives. Legal restrictions on violent political groups -- restrictions designed to protect members of the public from organized violence and racism -- are necessary and proportionate in a democratic society in the interest of public safety, for the prevention of crime and for the protection of the rights and freedoms of others. A ban on violent groups is compatible with human rights. If a group commits or participates in acts of violence, prepares for violence or promotes, encourages and glorifies violence it should be banned. Terrorist groups are already banned for these reasons in many countries, and no one thinks a ban on such groups is in violation of human rights standards of free expression and assembly.